Register UniFi Dan Streamyx Secara Percuma , Mudah , Cepat & Get Rebate!! : TM Unifi Announcement! Unifi Free Speed Upgrade Campaign Extended! TM Unifi Announcement! Unifi Free Speed Upgrade Campaign Extended! 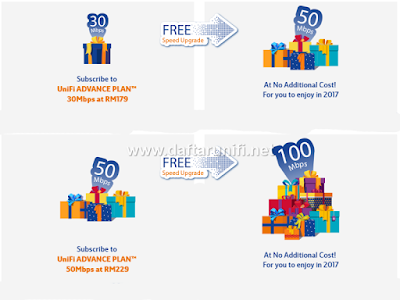 Unifi Free Speed Upgrade Campaign under TM Broadband Improvement Plan 2017 will be extended till 28th Feb 2017, migration date will start from Jan-Sept 2017 for customer who registered Unifi service before year 2017. Customer who subscribe THIS YEAR (2017) will enjoy the free speed upgrade starting from April 2017 onward.